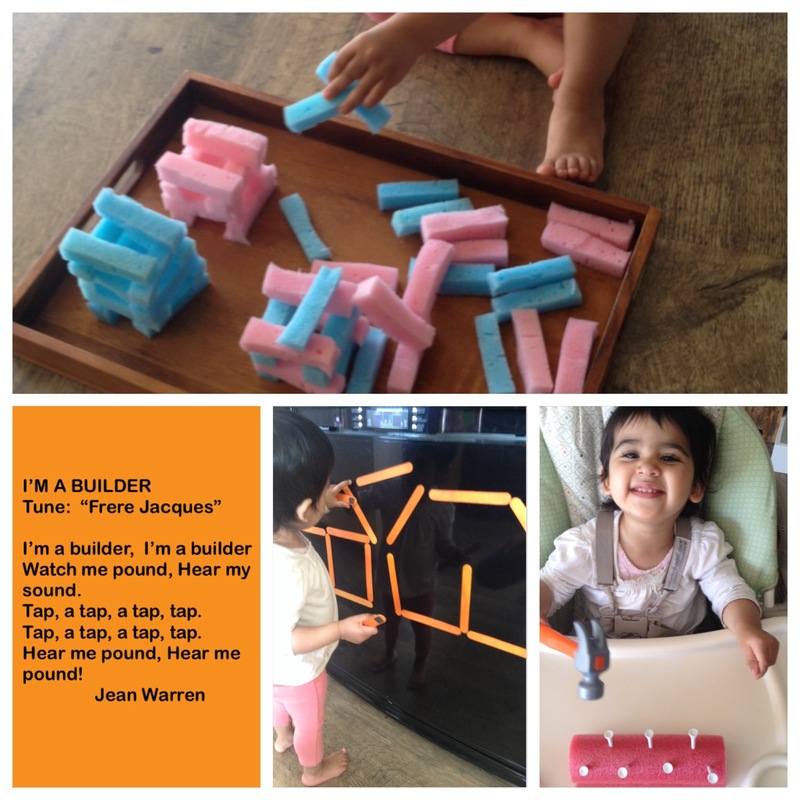 I’m a Builder by Jean Warren – R learned a new song today that we sang while practicing hammering. R enjoyed saying tap tap tap while she hammered! Singing songs is a great way to develop vocabulary with young children. With older kids, pause to explain the meaning of key words to ensure understanding. I put strips of magnetic tape on the back of craft sticks and attached them to our fridge for R to play with. I encouraged her to make shapes, but as usual, her favourite part was taking the sticks off. I would make a shape (square, rectangle, or triangle) and tell her the name of the shape. I would then take her finger and together we would trace the outline of the shape. She would then pull off the craft sticks one at a time and I counted aloud as she did so. a. 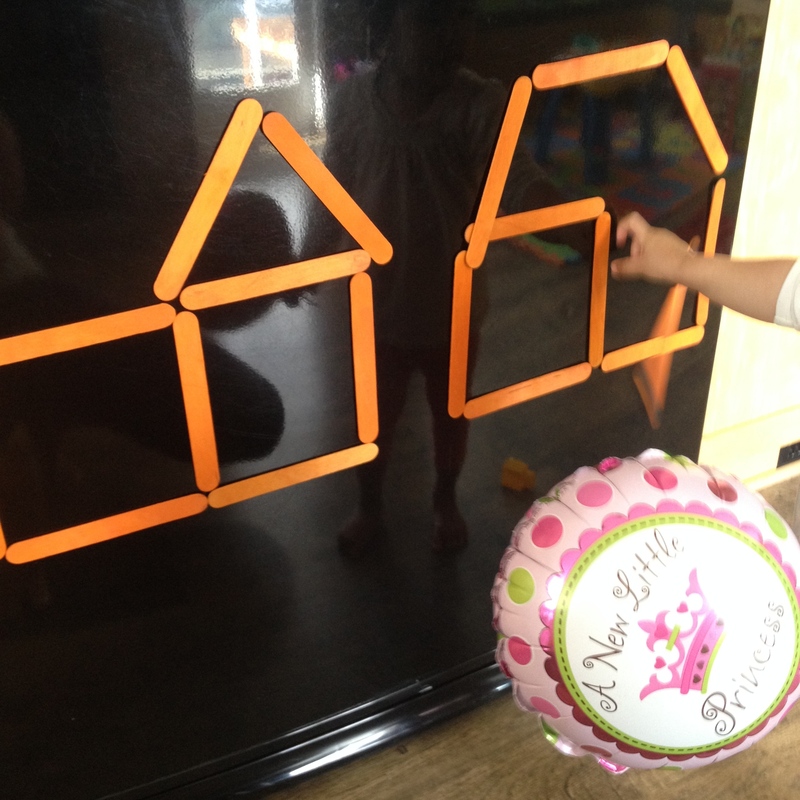 Show your child an outline photo of a shape such as a triangle. 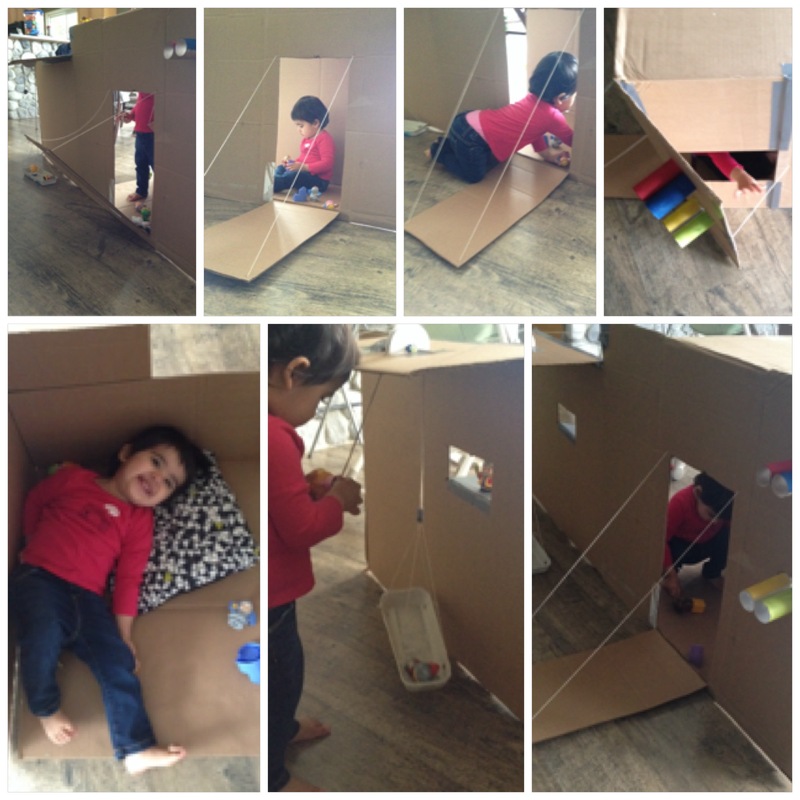 Have him/her replicate the shape on the fridge using the craft sticks. See Inside Castles by Usborne – See Inside Castles is a great book with lots of flaps to flip, making reading the book even more enjoyable, especially for reluctant readers. I had these books out in my classroom for quiet reading time. Many of the children, especially the boys in my class, were drawn to these books. Three Little Pigs by Sheryl Bone – R loves the board book version of the Three Little Pigs. I started reading this book to her back when she was 11 months old and she would love to do the “huff and puff” part with me. She still loves doing it now! Repeated readings are so important for kids since they help kids to develop the concept of print and develop reading-like behaviour. Reading like behaviours include holding a book in the correct orientation, flipping pages, and “telling” the story. The child does not need to read the words when s/he is beginning to read, instead, encourage young children who can speak to “read” the pictures. I pulled out our tub of Gears Gears Gears and added some play tools from Home Depot. R thought it was necessary to include her mega blocks princess with the activity. 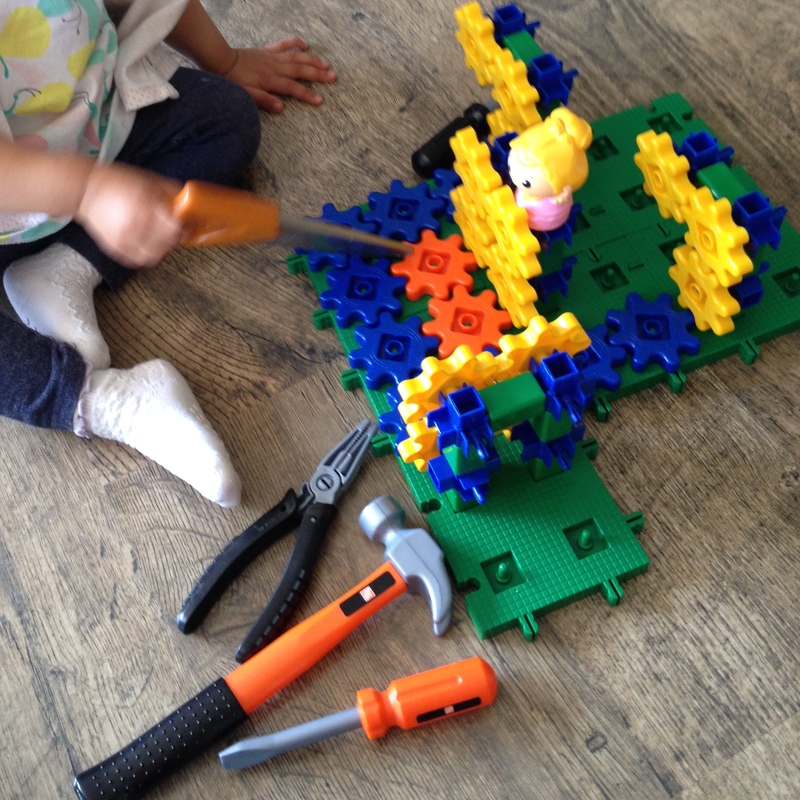 She enjoyed watching all the gears work together, and especially enjoyed hammering, sawing, screwing and plier(ing)?!? R got a lot of fine motor practice during this activity. She put the plastic screw drivers into the centre of the gear and used it as a crank to turn the gears. She had a tough time putting the gears on the board so that they would interconnect, so for the mean time, I made the interconnecting board for her. 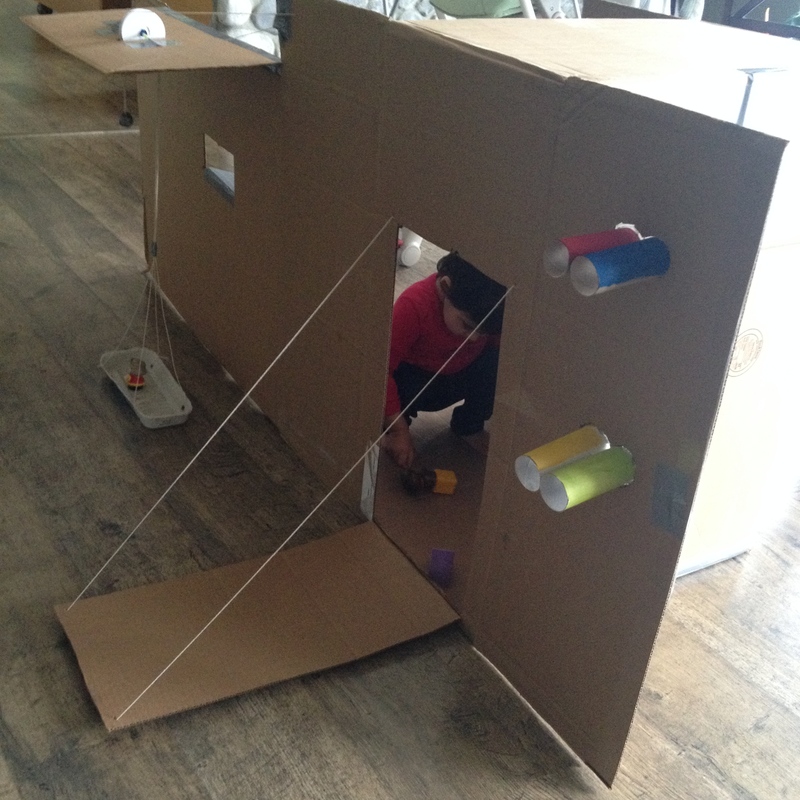 The construction portion of this activity is more developmentally appropriate for older children, but lots of learning and discovering still went on! a. Work on colours. Ask the child to build a yellow (or whatever colour) gear construction. b. Problem solve. Place one gear at one end of the board. Place a second gear away from the first gear (do not make them interconnect). Ask the child to figure out how to add more gears to the board in order to make the second gear move. Using the different connectors in the gears bin, you can build vertically also. 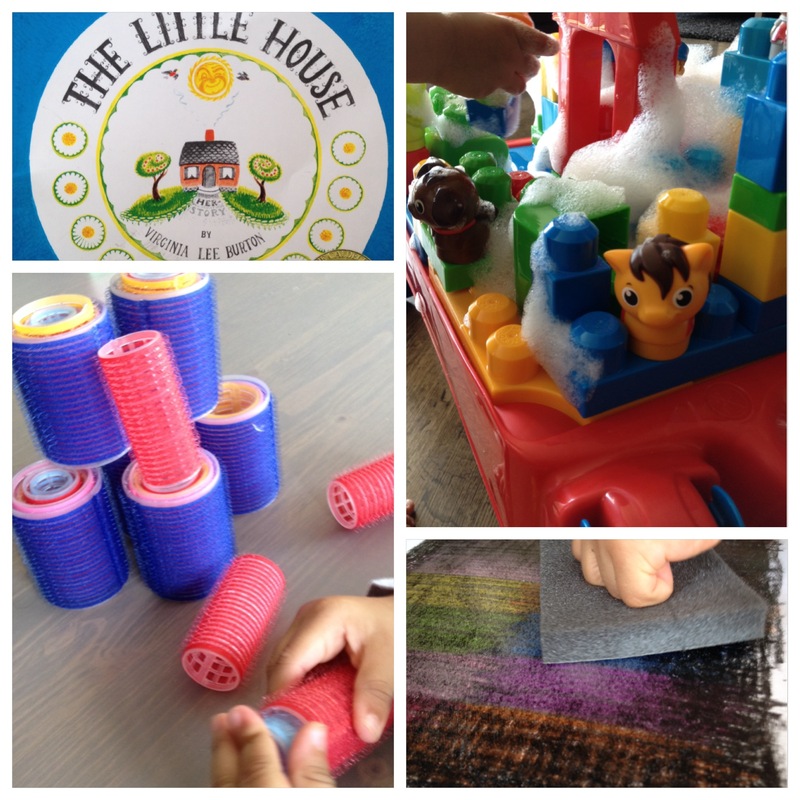 This way, you can create more and more challenging tasks for the child. The Little House by Virginia Lee Burton – The Little House is a wonderful story about a small town house that wanted to be a part of the big city but becomes sad once a busy city is developed around it. This story was identified as one of the top 100 best books for children by the National Education Association! 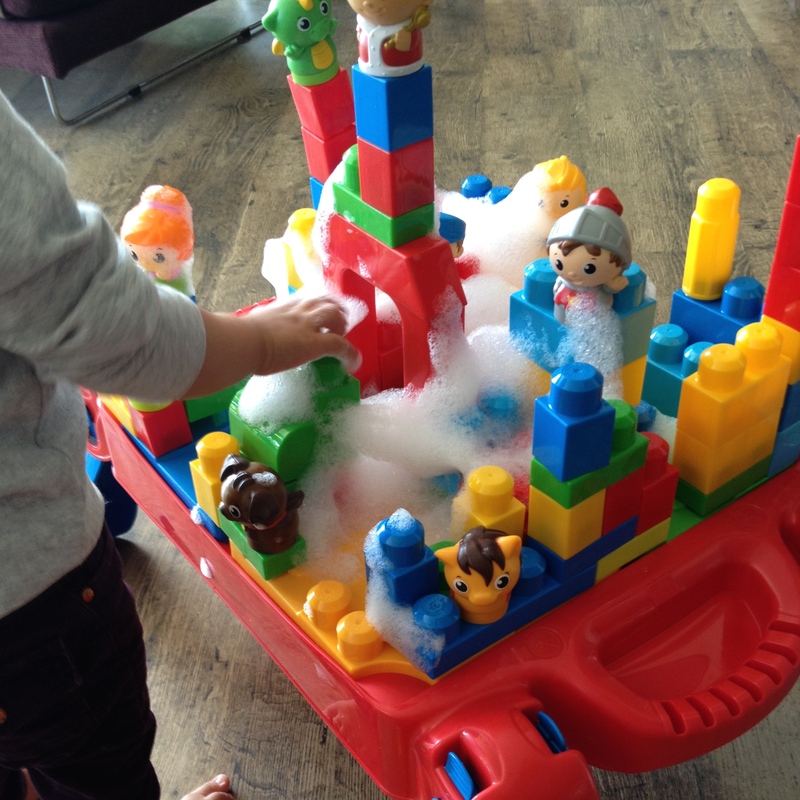 I scooped off some suds I made in a pot of soapy water and popped them onto R’s mega blocks table. She enjoyed washing the characters and her own arms. 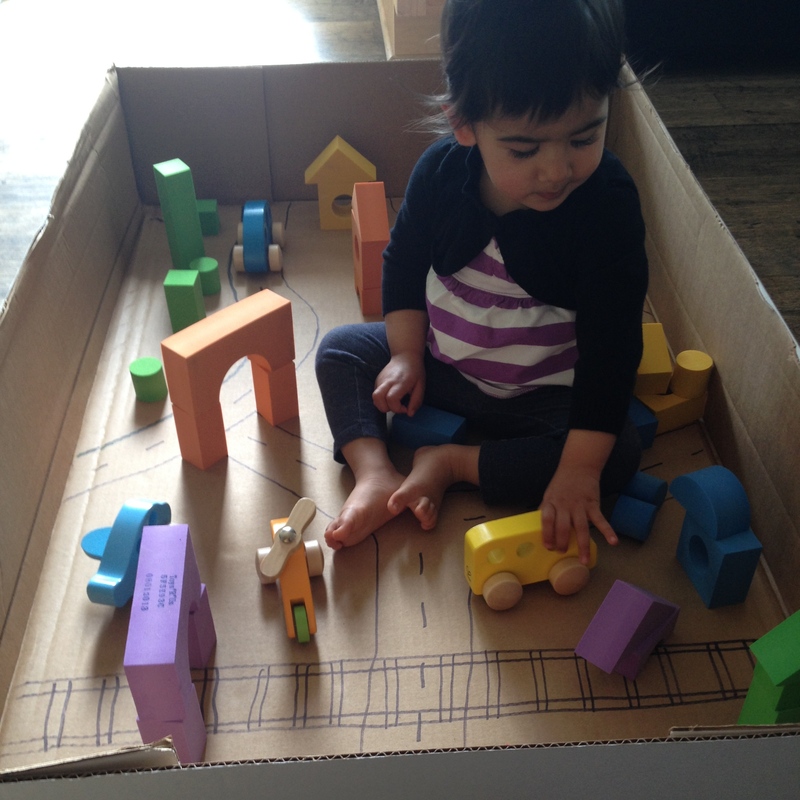 I added a tub of warm water beside her mega blocks table when she was finished playing, and she helped me wash the soap off the blocks. To easily make lots of suds, blend up one part dish soap and two parts water on high using an electric hand blender. a. Introduce the vocabulary words, “tall” and “short”. Demonstrate what a tall and short tower might look like and use the vocabulary works to describe your constructions. 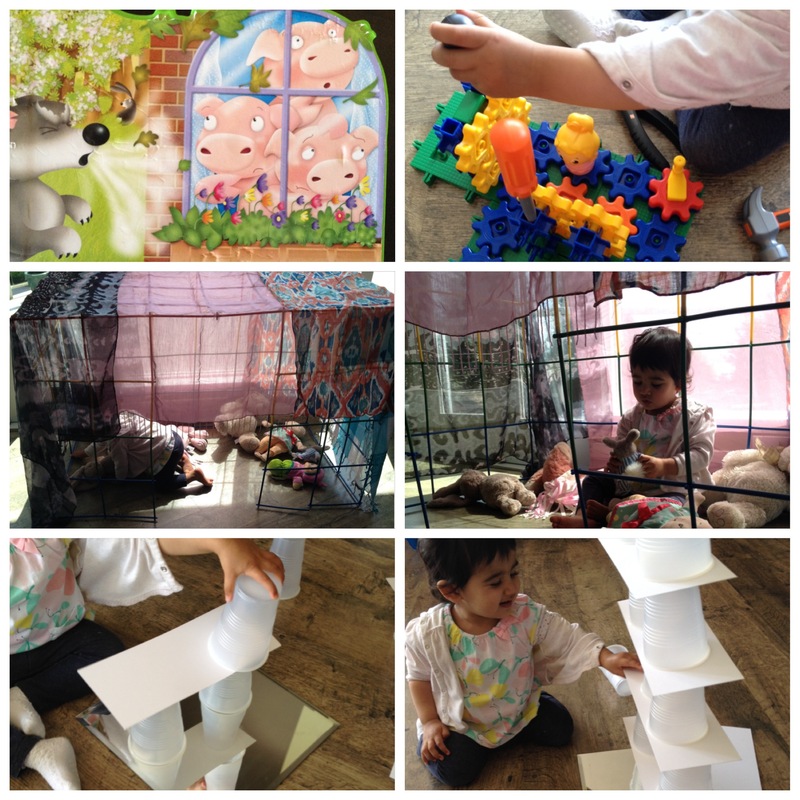 Encourage the child to build a tall tower and a short tower. b. Count the number of blocks in each tower. Ask older children the following open-ended questions: what is the most number of blocks in a short tower? What is the least number of blocks in a tall tower? c. Practice patterning with older children. In the beginning stages, have the child replicate simple “AB” patterns. 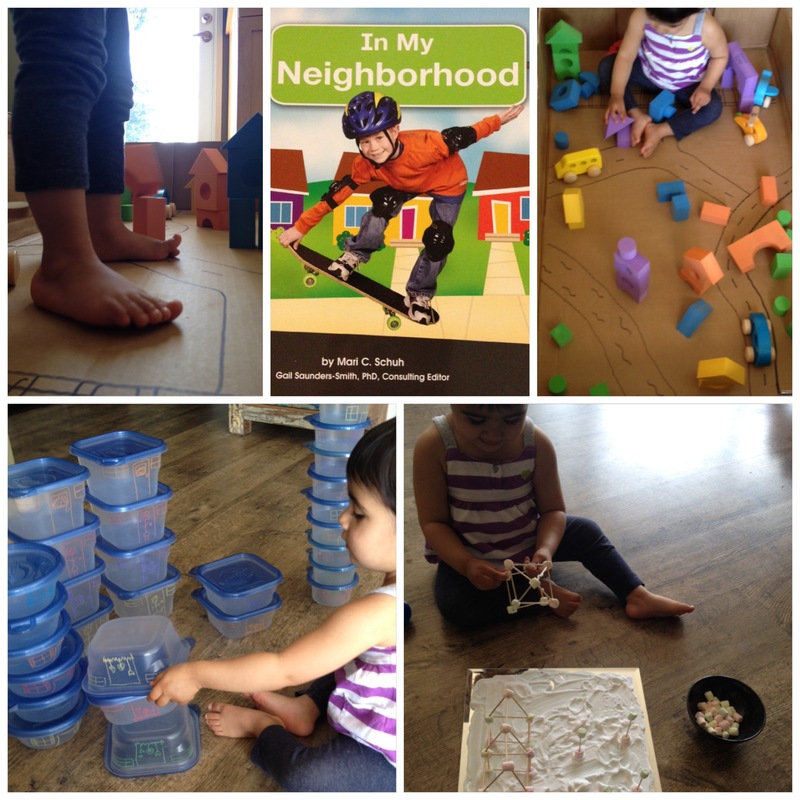 As his/her skills develop, as him/her to build patterned towers using two or more colours.